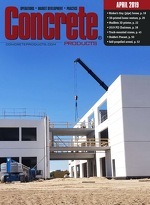 Concrete contractors in eastern Pennsylvania, New Jersey and Delaware will begin receiving ready mixed orders in front discharge trucks operating at unusually low noise levels and with no hint of diesel combustion, thanks to adoption of compressed natural gas (CNG) power in the fleets of Delaware Valley Concrete (DVC) and Silvi Group. The producer has a fleet of 88 mixers, dumps, tankers and other heavy trucks serving its nine concrete plants in southeastern Pennsylvania, and will deploy five more CNG mixers this spring—toward a 2015 target of having a substantial percentage of its fleet running on natural gas. With three ready mixed plants each in Pennsylvania and New Jersey, Fairless Hills, Pa.-based Silvi Group is likewise turning to CNG power for a sizable portion of its mixer fleet, committing to 30 S-Series Ngen models. Oshkosh showed the first one at World of Concrete in Las Vegas, prior to delivering the vehicle to eastern Pennsylvania. “Silvi Companies are leaders and innovators, with a strong commitment to environmental protection, and we applaud this important migration to the McNeilus Ngen system,” adds Oshkosh Commercial Business Segment President Brad Nelson.